MHA Today is provided as a service to members of the Missouri Hospital Association. Additional information is available online at MHAnet. MHA staff and members are in Washington early this week for briefings with the Congressional Delegation in conjunction with the American Hospital Association’s annual meeting. Missouri U.S. 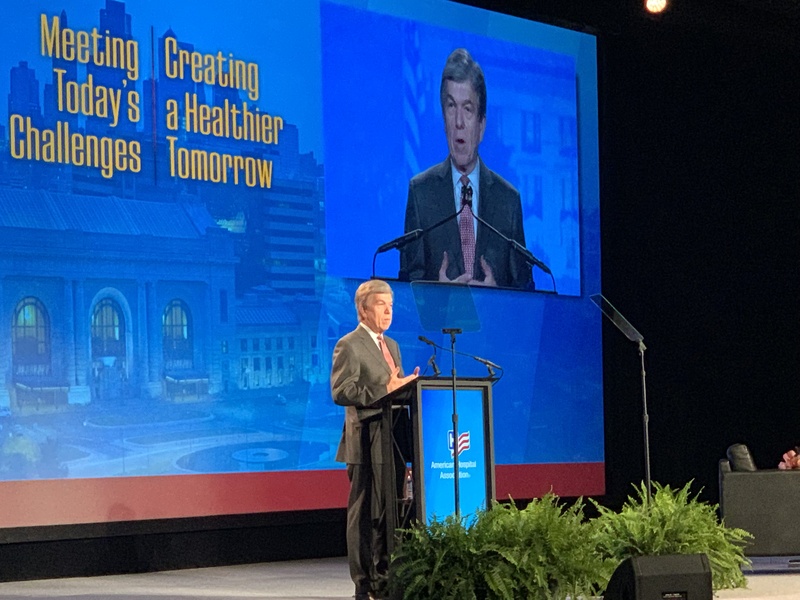 Senator Roy Blunt addressed the American Hospital Association Annual Meeting today. During his remarks, he mentioned a variety of topics, including his long support for health research through The National Institutes of Health and for behavioral health services, including funding to address the national opioid crisis. He underscored that hospital emergency departments shouldn’t be the venue where behavioral health care is delivered. Blunt received enthusiastic support from the audience for his work to bring the U.S. Department of Health and Human Services and Occupational Health and Safety Administration together to address the issue of violence in hospitals. Last year, as chair of the Appropriations Subcommittee on Labor, Health and Human Services, and Education, Blunt included in the HHS appropriation a joint HHS-OSHA report on hospital workplace safety. The report is overdue; Blunt has discussed the status of the report with Secretary Azar. On Monday, the House Health and Mental Health Policy Committee heard House Bill 1235 — a bill that MHA has developed and is promoting — which would reverse the 90 percent of fee-for-service reimbursement limit the MO HealthNet Division put on hospitals that do not contract with Medicaid managed care plans. MHA staff gave testimony in favor of the bill, as did the representatives of several MHA member hospitals. The bill is sponsored by Representative Mike Stevens of Bolivar. The Missouri ZIP Health Rankings data included on exploreMOhealth.org were updated on April 1 to reflect the most recent information on the health and social well-being of populations living in 940 Missouri ZIP codes. The Missouri ZHR are designed to assist hospitals and community health stakeholders identify high-risk communities within counties to optimize the effectiveness of community health improvement interventions. Developed through a partnership between researchers at HIDI, Washington University School of Medicine and BJC HealthCare, ZHR provide a unique approach to measuring community health at the ZIP code level using hospital discharge and American Community Survey data applied to the County Health Rankings model of population health. 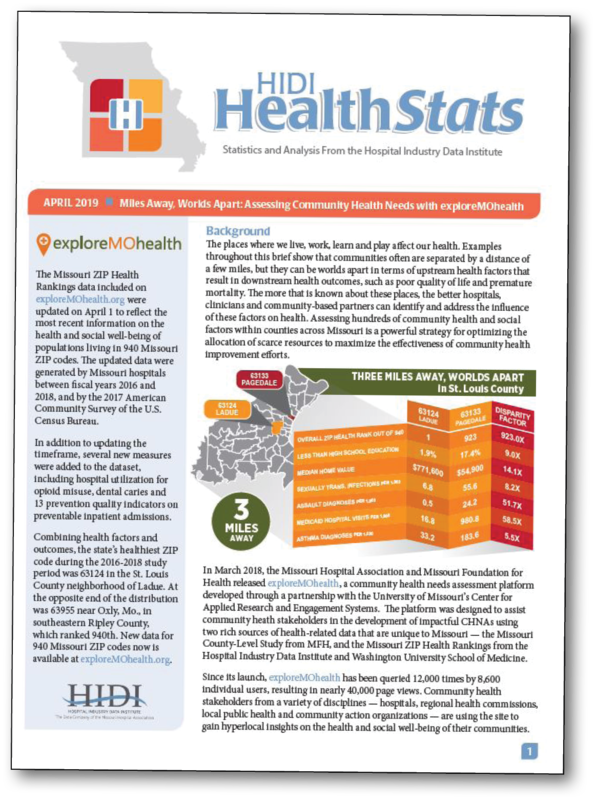 Included in the April edition of HIDI HealthStats are three exploreMOhealth case studies from BJC HealthCare, Carroll County Memorial Hospital and St. Louis Regional Health Commission. The Institute for Healthcare Improvement is hosting a free informational call at noon on Wednesday, April 10, for the Framework for Effective Board Governance of Health System Quality White Paper. IHI’s experts, Beth Daley Ullem, President of Quality and Safety First, and Kedar Mate, M.D., IHI Chief Innovation and Education Officer, will discuss a widening case definition of quality, including how quality discussions should be integrated into board discussions. LeadingAge Missouri, in collaboration with MHA and the Missouri Chapter of the American College of Healthcare Executives, is hosting its 3rd Annual Summit for Acute & Post-Acute Care Providers: Insights and Perspectives on Care Coordination and Value-Based Care. The summit will be held on Wednesday, May 8, in St. Louis with topics to include affordable and accessible care, behaviors to improve health, care collaboration, health care consumer perspectives, and more. ACHE will apply for the maximum allowable face-to-face education credits for the program. Additional information, including online registration, is available. A study of workplace injuries in 27 states, including Missouri and Illinois, shows rural workers injured on the job received prescriptions for opioid pain relievers 68 percent of the time, while their urban counterparts got them 44 percent of the time. Persons using assistive technology might not be able to fully access information on this website. For assistance, please contact us. Select 508 Accommodation in the department field.